DANVILLE, IN (November 15, 2016) – The Rural Routes to Main Street Cultural Trail kicked off its eighth year this week welcoming a third county into the fold and debuting a new logo and guidebook. 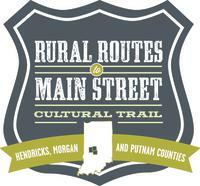 The Rural Routes to Main Street Cultural Trail has become a true visitor destination over the past seven years. This self-guided, self-directed driving tour, which features sites such as art galleries, local studios, restaurants, confectionaries and many other locations that make or sell handmade goods, began as a partnership between Visit Hendricks County and the Hendricks County Arts Council in 2010. A state grant made expansion into Morgan County possible in 2013 and now another Indiana Office of Tourism Development grant awarded late last year starts a new chapter just in time for the holidays by adding locations in Putnam County. Packaging talented artists, amazing attractions, one-of-a-kind products and local eateries, the trail and its accompanying guidebook give visitors and even locals an insider’s perspective of the destinations that should not be missed in Hendricks, Morgan and Putnam counties. The redesigned 47-page guidebook details every stop making it easier for visitors to choose the attractions that interest them while boasting a journal feel allowing them to take notes before and during their visit to detail what they want to see and what they loved about the trail. The new 2017 Guidebooks are now available and free and can be picked up at any of the locations along the trail, at the Visit Hendricks County office in Danville, Visit Morgan County office in Martinsville or the Putnam County visitor center in Greencastle. You also can request a copy or print an electronic version online at RuralRoutestoMainStreet.com. The 2017 Rural Routes to Main Street Cultural Trail includes 34 members in the three counties who are open a minimum of Thursdays-Saturdays year-round. A Second Saturdays component opens the trail up to ten additional sites on the second Saturday of every month. For more information about the trail, visit www.RuralRoutesToMainStreet.com or visit or call Visit Hendricks County, 8 W. Main St., Danville, (800) 321-9666 to receive a printed guidebook or for assistance with overnight accommodations.